Well, the word “Belkin Router” reminds us of people having a hard time in logging into the Router’s dashboard. But we already published an article on How to Login into Belkin Router 192.168.2.1? (Working 2018). Which helped a lot of people in getting into the dashboard of Belkin router by using a default gateway 192.168.2.1. In this article, we are also providing you the best way of resetting the default settings of Belkin router. Now, the question arises what is the need of resetting a router? well, there might be a case where a user forgets the wifi password, or the router is not working properly or maybe acting strangely. So, in that scenario, a user must need to perform a reset in order to make Belkin router setting set to default. 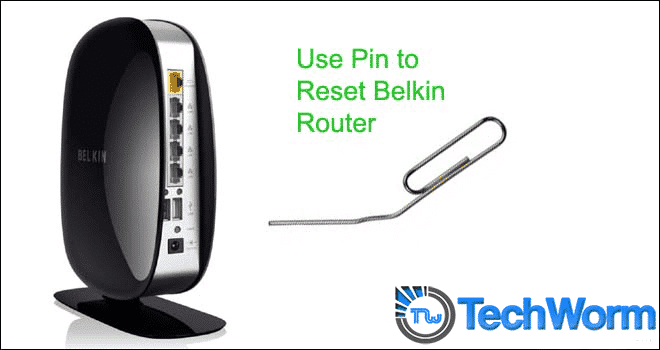 There are basically 2 ways of Resetting Belkin router. Soft Reset – In Soft Reset method, you need to first get access to the router’s dashboard by using the default gateway 192.168.2.1. Then go to settings followed by Administration and then click on Factory Restore. Wait for a minute and let the Belkin Router Reset. At last Restart, the Belkin router and you are done. Hard Reset – Hard Reset is completely different from Soft Reset. It requires you to get your hands physically on the router. If you are not able to perform Soft Reset than Hard Rest will do work for you. All you need is to look at the back of Belkin Wireless Router and you will find the Reset button there. For Better understanding see the image below. Use your finger, pen or pin. Press the Reset Key at the Back Of the Router. Hold the key for at least 30-40 seconds and you are done. You can also Restart the modem and computer to let things work properly. Your Router is properly reset and now you can perform any manipulation you want by visiting its dashboard with the help of its default gateway 192.168.2.1. So this was all regarding the Resetting of Belkin router Using default gateway 192.168.2.1.